© SEGA. SEGA AND THE SEGA LOGO ARE EITHER REGISTERED TRADE MARKS OR TRADE MARKS OF SEGA HOLDINGS CO., LTD. CREATIVE ASSEMBLY AND THE CREATIVE ASSEMBLY LOGO ARE EITHER REGISTERED TRADE MARKS OR TRADE MARKS OF THE CREATIVE ASSEMBLY LIMITED. ALL RIGHTS RESERVED. 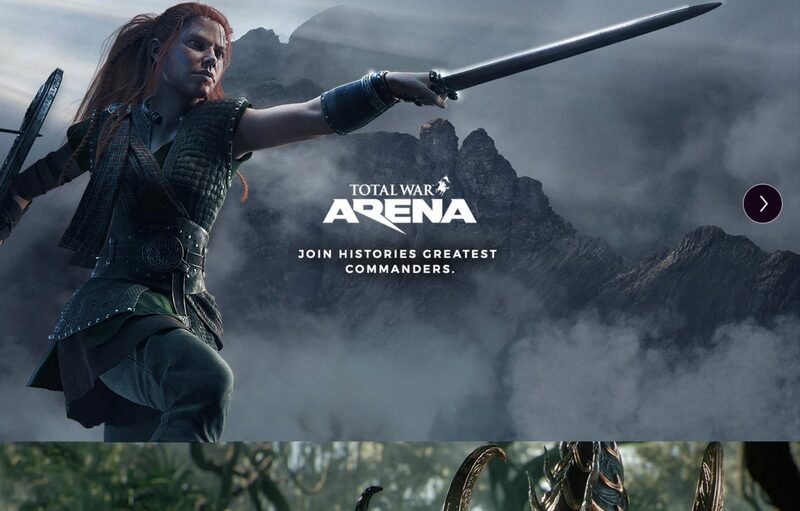 Creative Assembly are the British video game development team behind Total War and Alien Isolation. Founded in 1987 they joined the SEGA family in 2005 as a European subsidiary. 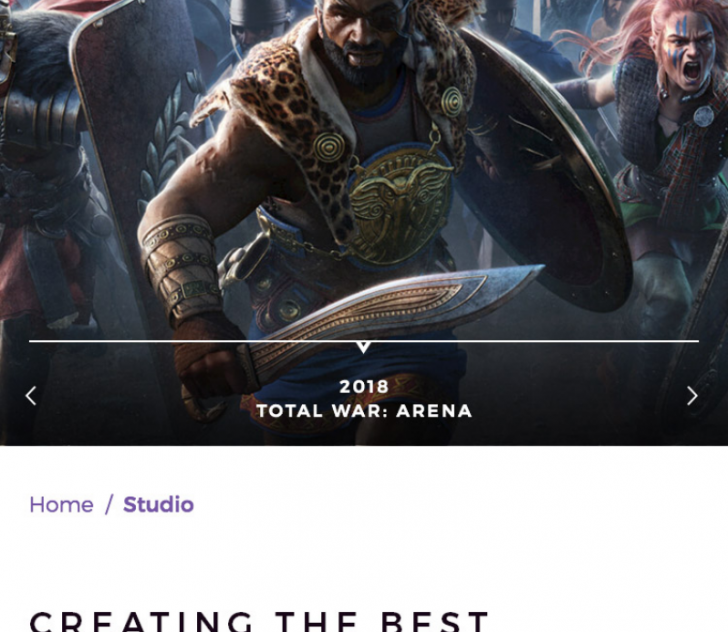 Creative Assembly approached Strawberrysoup with a view to redesigning their corporate website. 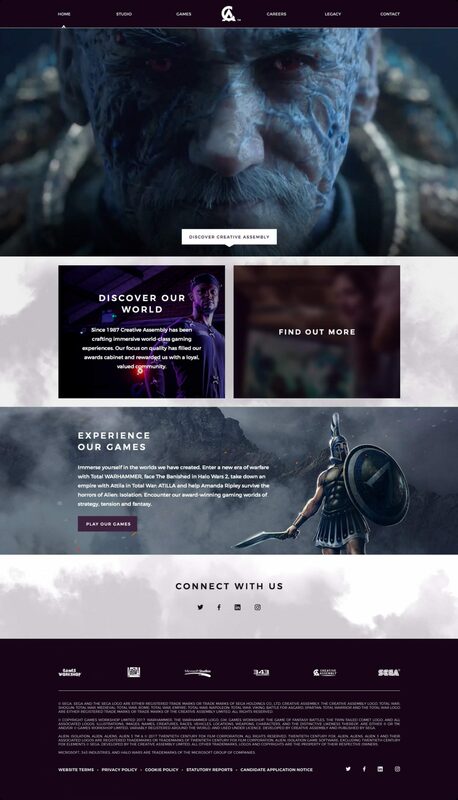 We worked with their team to deliver a ground-breaking new website that served to better showcase the legacy Creative Assembly is building. A core part of the project was a brand refinement exercise. Our first area of exploration was typography. We wanted a versatile typeface that also worked well alongside the Creative Assembly brand. A bespoke set of icons were carefully crafted to fit around the other brand elements. These were then used on the Careers page as a means of filtering. 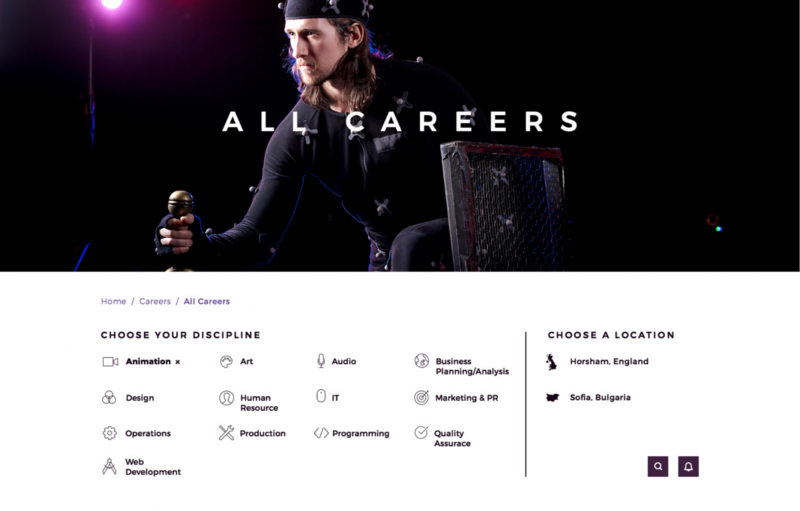 This filtering enabled users to drill down to a specific careers sector quickly and easily. 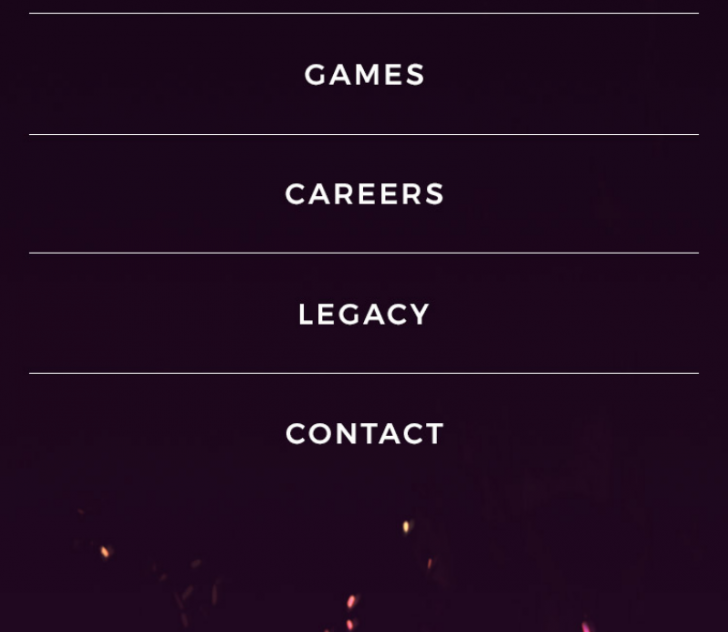 Running the brand throughout the new website was core to ensuring brand consistency. The new brand assets were run across the site in a concise and consistent manner was key to the sites success. From colour usage to typographic structures, we crafted a site that utilised the brand assets properly. 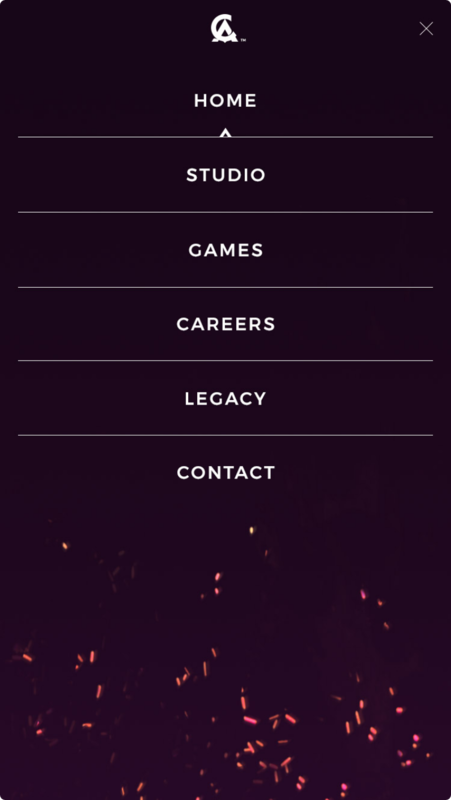 The result is a slick site that carefully strikes a balance of brand, photography and game artwork. 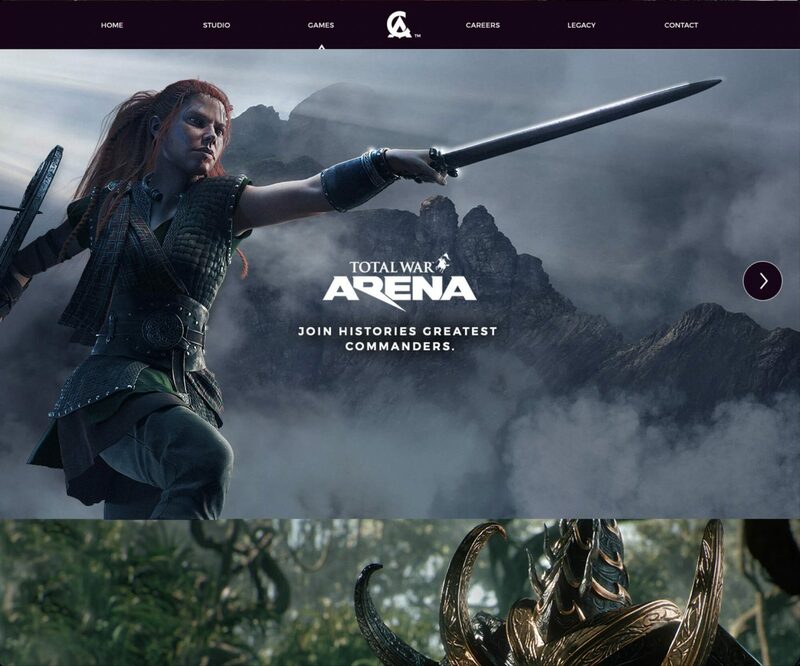 The Creative Assembly site serves as a key platform for recruitment. 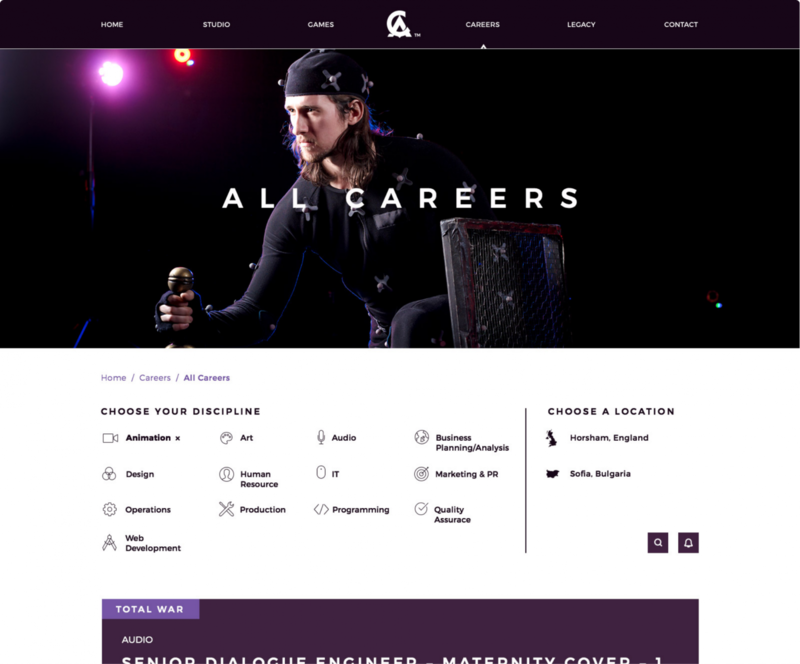 We built the site on Drupal 8 and integrated it with Jobvite’s API to pull the careers listings in automatically. 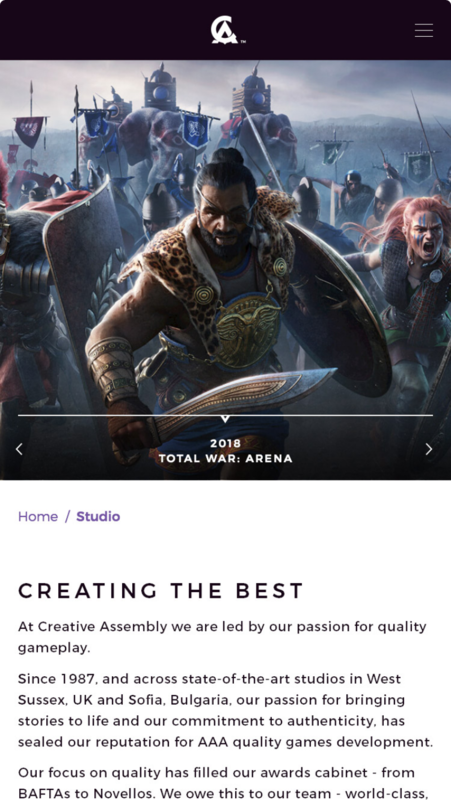 In order to attract new talent, it was key to put a focus on the quality of work and reflect Creative Assembly’s ethos – inviting potential employees to work with a diverse and talented team of like-minded people doing great work and building a legacy. We were tasked with bringing the history and heritage of Creative Assembly to life online. To give a true sense of progression and provide users with an immersive experience, we went through a painstaking process of image editing, stitching and enhancing lighting and shadows to effectively stitch the history of the studio into a seamless tapestry of key milestones and work.